Wondering what is the best way of growing app installs if your ads budget is limited? You need to find cheap user acquisition channels and methods of getting your application to the customer. How to achieve this? Well, go to where your customers are! According to Apple, organic app store search initiates 65% of all downloads on the average. People tend to go directly to the App Store or Google Play for finding an application they need, and keyword optimization is what makes an app visible to this audience. 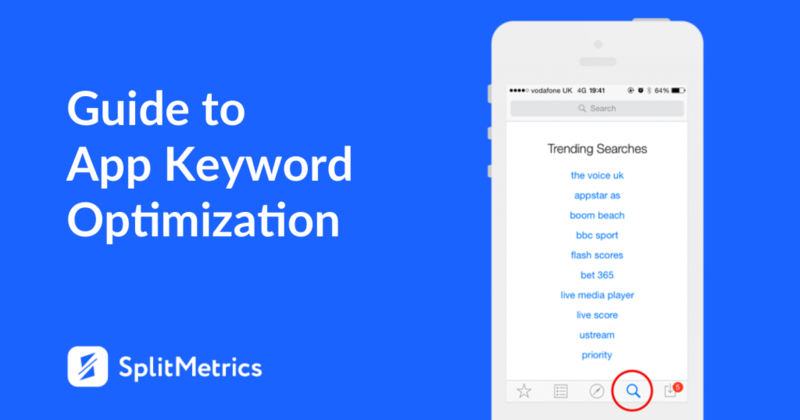 In the article, we have collected tips on how you can develop your keyword optimization strategy from scratch to grow visibility and downloads in app stores. 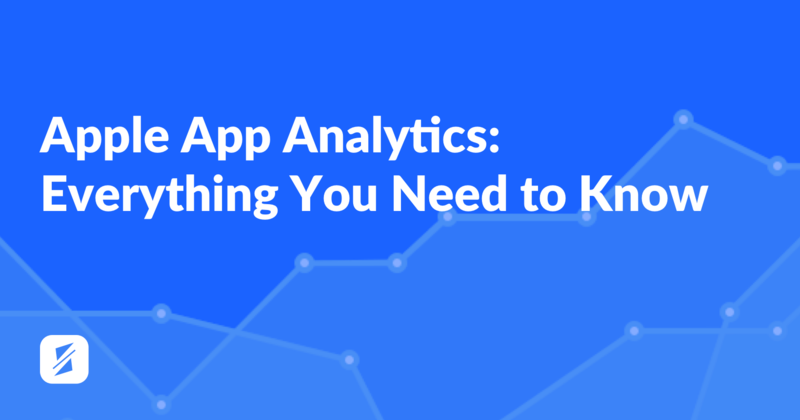 This guest post was created by Silke Glauninger, Marketing Manager at App Radar – an App Store Optimization and publishing tool that not only tracks keyword rankings but helps with publishing app metadata to app stores. Silke helps app startups and companies unleash the full potential of their apps. The first step to developing a keyword optimization strategy is to research possible search terms and keywords relevant to your application. To do so, you start with brainstorming keywords around your features and possible use cases. Keep in mind who your users are and what language they use. Which words could they use when searching for your app? scanning forums and groups on social media. Another way to find search terms is to make use of keyword suggestions in the App Store, search engines or ASO tools. Such app store optimization tools as App Radar help you find keywords by showing ones that include a particular search term. Let us say when searching for an application that tracks running, people might not use “running app”. Instead, they enter “running distance tracker” or “run tracker” into the search field, and keyword optimization tools are on a mission to give app developers a clue about it. As you have a list of keywords now, the next step is to sort them out. There is one simple rule you should follow to find out which keywords are worth including in your app page metadata. 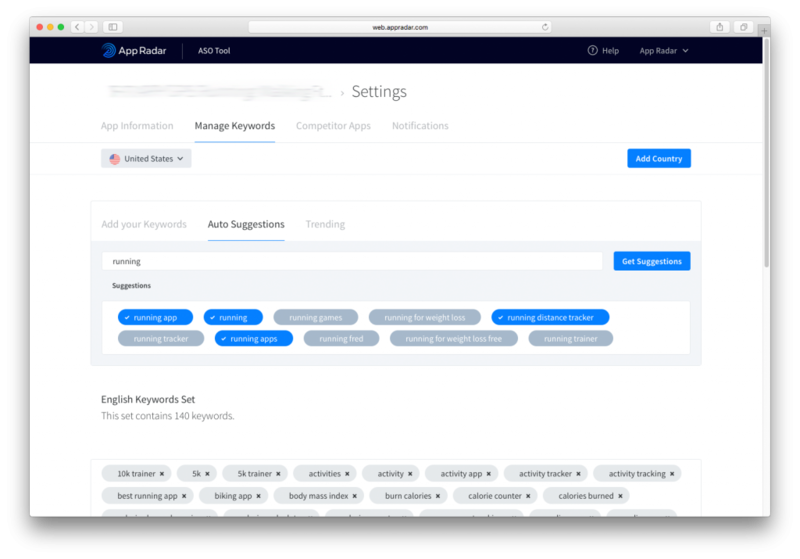 To evaluate the importance of each keyword for an application, a developer will look at three elements: relevance, competition, and search volume. The relevancy is the king here. 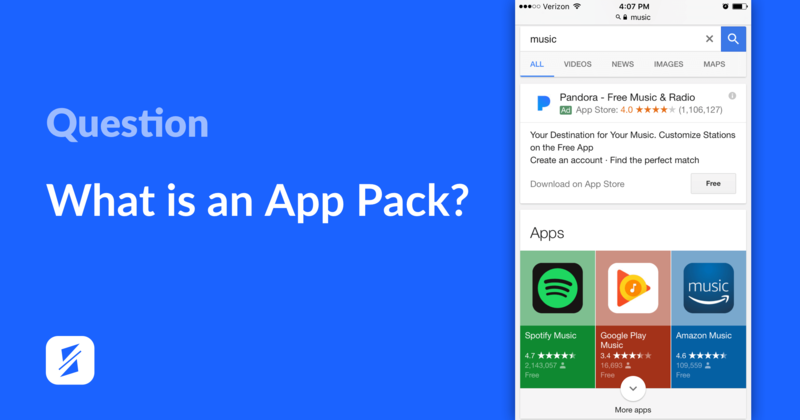 High-volume search terms won’t drive installs if they have nothing to do with the actual content of your app. Adding to this, users who accidentally download an irrelevant app will show a low retention and engagement rates. And since app stores consider both installs and usage metrics as ranking factors, irrelevant keywords will rather ruin app’s rankings than boosting it. Instead, app keyword optimization is about increasing impressions, traffic, and downloads. Thus, the search popularity and keyword competition are even more essential when it comes to the development of the keyword optimization strategy. The keywords you choose to focus on, should show a balance in popularity (How often do people use this keyword in the app store search?) and competition (Do your strongest competitors already rank for this keyword?). You want the app stores to index your application for chosen keywords. Since some of the keywords will always be more important than others, you have to find the right spot for each of them. Although the official ranking algorithms of the App Store and Google Play are not public, sharp-witted developers have identified elements that influence app rankings. For instance, it is common for both stores that the app title is not only the first thing a potential user sees but also the most relevant factor for keywords rankings. Keywords placed in the name count the most. There are other app page elements, which can influence keywords rankings, some more, some less. 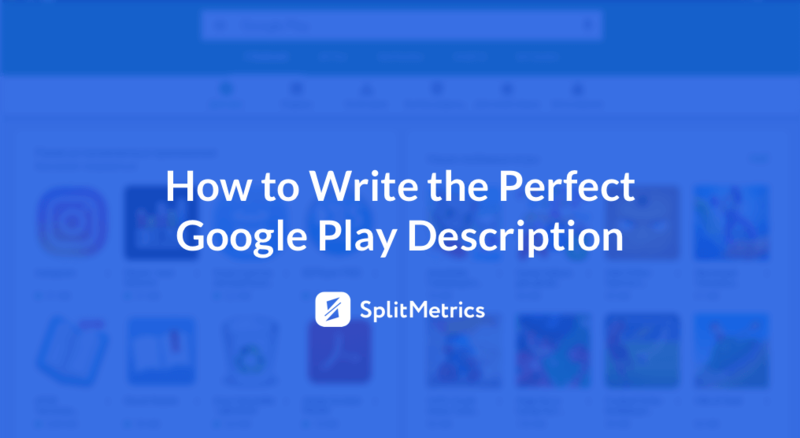 Although an app description does not influence rankings on the App Store, description optimization helps developers increase app relevancy when it comes to Apple Search Ads. Please note: When optimizing landing page elements, it is important to keep in mind an app conversion rate. To make sure, changes do not affect the tap-to-install conversion in a negative way, app developers us mobile A/B testing. Adding to the fact that a developer needs to optimize each text element of the app page to get significant results, it is important not only where you use keywords but also in which order you put them. It would be way too easy if you just put keywords somehow into the keyword field and that’s it. Besides various ranking factors like the number of downloads, usage metrics, ratings and reviews, the position of keywords in these fields is taken into account. So, what you want to do is to consider bringing the most relevant keywords to the front and then sort other keywords in a descending order. If you want to know more about keyword optimization, visit App Radar’s App Store Optimization Guide. Sometimes app store optimization looks easier than it is. In fact, the app store ranking algorithm is a black box, and you have to go through a trial process. To define in which direction you should move in your keyword optimization strategy, you need to know your current keyword rankings and be able to evaluate changes after every step you take. This could be tricky as rankings will vary depending on the number of app versions, stores, and localizations. 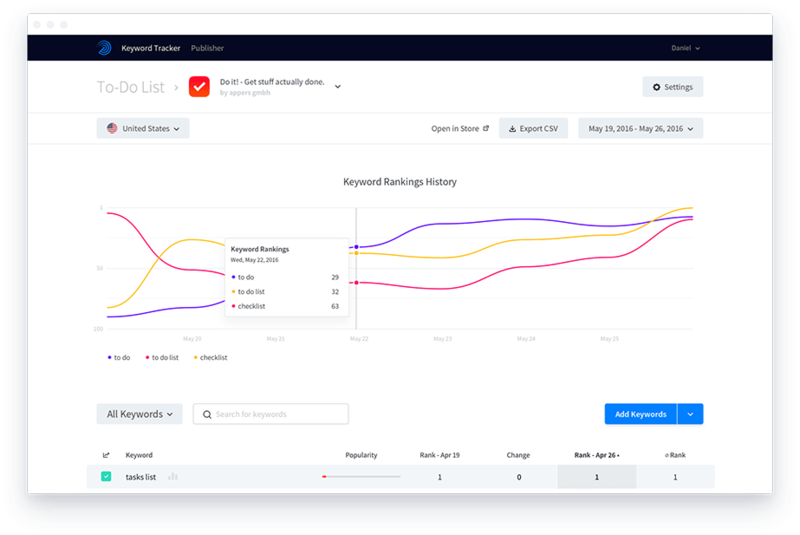 Therefore for this, you will want to use keyword tracking tools that deliver accurate keyword rankings across both major stores and various localizations of your application in a form of a compact overview and detailed statistics. App Radar offers this functionality and also delivers ranking reports directly to user’s Inbox or Slack Channel. The main language for a vast majority of applications is English. However, the English language is actually spoken by roughly 5 % of the world’s population. Do you think an app could cross borders if it is offered in English only? Unlikely! What can help your application go global and bring your keyword optimization strategy to the King level is Localization. 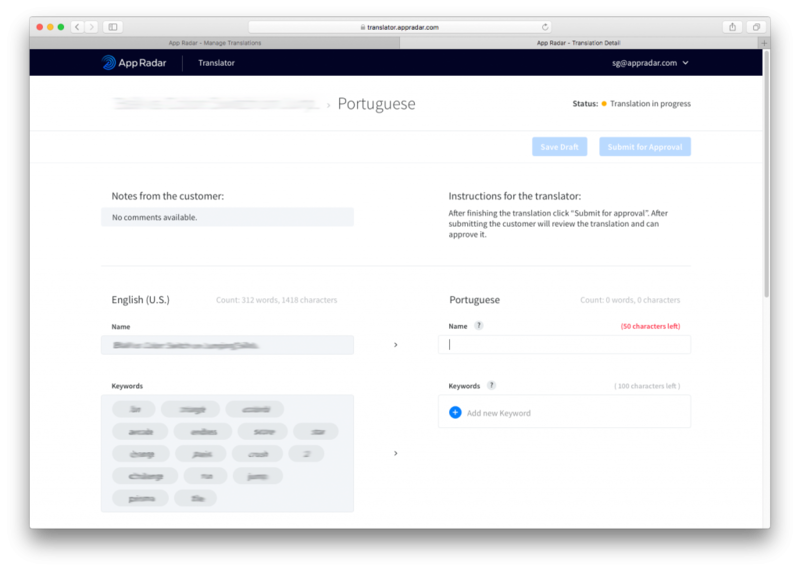 Localization (or international ASO) means that you translate your app page to various languages so that users who are looking for an app in their native language could easily find it. You can adapt the appearance to the localized market by putting alternative metadata, keywords and screenshots (soon video preview). Since not every language is similar, a localization requires not only translation skills but a deep understanding of cultural aspects. For this reason, we advise you to work with translation agencies when localizing your metadata as only native speakers or trained translators can help you find keywords that are actually used by the target audience. The truth is KEYWORDS ARE ALWAYS A MESS. A translation table could help with collecting keywords and matching them and metadata with an original version. Again, such ASO tools as App Radar are here to handle this by offering a synchronization with your iTunes Connect. So, instead of working with messy spreadsheets and transferring keywords manually, you will want to use keyword automation tools that encapsulate translating and publishing metadata in a single dashboard. Localizing your app page, you not only stimulate app installs but also increase the number of possible keyword rankings. Make sure you have your metadata translated into the languages of your key markets! App store optimization is an iterative process, so is keyword optimization. We recommend you to update your app and optimize metadata regularly to make sure your keyword optimization strategy is working on increasing organic traffic. By tracking your rankings continuously, you have the best chances to come up with brilliant ideas on how to boost downloads. Although keyword research and optimization can be time-consuming, it is doable and pays off in the end.